Assistant professor Jazan University-Faculty of Medicine Internal Medicine/Gastroenterology, Jazan, 104 Saudi, Arabia 00966560980778. *Address correspondence and reprints request to: Erwa Eltayib Elmakki, Assistant professor Jazan University-Faculty of Medicine Internal Medicine/Gastroenterology, Jazan, 104 Saudi, Arabia 00966560980778. Elmakki EE. A Rare Presentation of Hepatocellular Carcinoma in a Young Adult: A Case Report. Oman Med J 2014 Jan; 29(1). Hepatocellular carcinoma is the most frequent type of liver malignancy. Most cases of hepatocellular carcinoma are secondary to either viral hepatitis (hepatitis B, C) or alcoholic cirrhosis. Liver cirrhosis due to any other causes is considered as a risk factor for development of hepatocellular carcinoma; however, hepatocellular carcinoma in a young patient with no cirrhosis or fibrosis is a relatively rare condition. The present case report describes a young 24-years-old male patient who presented with a two-month history of fever, right upper quadrant abdominal pain, and weight loss with no evidence of pre-existing liver disease, initially treated as liver abscess; however, a computed tomography (CT) showed numerous hepatic hypodensities with ring enhancement. Serum alpha-fetoprotein level was high (>1000 ng/L) and histopathological study confirmed the presence of primary hepatocellular carcinoma. The present case findings suggest that multifocal hepatocellular carcinoma can occur in a young patient with no apparent risk factor, and that the clinical presentation of hepatocellular carcinoma can be similar to liver abscess. 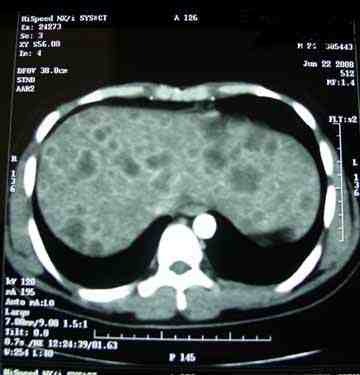 Keywords: Hepatocellular carcinoma; Liver abscess; Chronic liver disease. A 24-year-old patient was admitted to our hospital with a 2-month history of right hypochondriac pain and fever. He also reported decreased appetite, significant weight loss, and occasional vomiting but there were no other symptoms. He gave no history of chronic medical illnesses; there was no drug or family history of note. He denied cigarette smoking or alcohol consumption. Before presenting here, the patient was already previously seen in another hospital in which a diagnosis of liver abscess was made. On examination, he appeared sick, jaundiced and febrile, with a body temperature of 38.5°C. Abdominal examination revealed a palpable liver (10 cm below the right costal margin, irregular, firm and tender), no splenomegaly or ascites. He had no peripheral stigmata of chronic liver disease, neither signs of hepatic failure. Examination of other systems was unremarkable. Accordingly during admission, intravenous antibiotics (in the form of ceftriaxone and metronidazole) were given without improvement. Abdominal ultra-sonogram was done and showed multiple hypodense hepatic lesions; otherwise, there were no signs of portal hypertension or ascites. A computed tomography (CT) revealed multiple hypodense hepatic lesions with ring enhancement (Fig. 1). Serum alpha-fetoprotein level was >1000 ng/L (normal <3 ng/L). Histopathological study of liver specimen reported poorly differentiated malignant cells consistent with hepatocellular carcinoma (Fig. 2). CBC revealed a Hb of 14.6 gm/dL, WBC of 11300/cmm, and platelets of 291,000/cmm. LFTs showed total bilirubin of 35 mmol/L (reference range 0-17), ALT 54 IU/L (30-65), AST 74 U/L (15-37), alkaline phosphatase 344 U/L (50-136), GGT 646 U/L (1-94), total protein 64 g/L (64-82), albumin 33 g/L (34-50). PT and PTT were normal. Serology for viral hepatitis including HBsAg, HBcAb, and HCV-Ab was negative. Also, PCR for HBV-DNA was negative. Iron panel was normal. RFTs and electrolytes were normal except for hypercalcemia (serum Ca++ of 3.32 mmol/L), but PTH and phosphate were normal. Septic workup including urine and blood culture showed no evidence of infection. Metastatic workup including PSA and CEA levels, chest-x-ray, chest CT scan, bone scan, upper and lower GI endoscopies were all normal. He received only symptomatic treatment and a decision was made to refer him to a higher hepatology centre for further management, but the patient preferred to go to his native country. Figure 1: CT revealed multiple hypodense hepatic lesions with ring enhancement. Patients with HCC diagnosed at an early stage are optimal candidates for resection, liver transplantation or percutaneous ablation. Surgical resection is recommended for patients with single tumors, absence of clinically relevant portal hypertension and normal bilirubin. Transplantation is indicated in patients with 3 nodules of <3 cm or with single tumors <5 cm with liver function impairment precluding resection. Transarterial chemoembolization (TACE) is recommended in asymptomatic patients with multinodular tumors that have not invaded hepatic vessels nor been disseminated outside the liver. Sorafenib is indicated as the first line of treatment in patients who cannot benefit from the above therapeutic options and still have a preserved liver function.12,13 Finally, the rare clinical presentation and the age of the patient at the time of presentation are the interesting features of the case. Although HCC is common worldwide especially in areas in which there is a high prevalence of viral hepatitis B and C, multifocal HCC in young adults without clear risk factors is an extremely rare case. 1. El-serag H. Hepatocellular carcinoma: review article. N Eng. J Med 2011;365:1118-1127. 2. Trevisani F, Frigerio M, Santi V, Grignaschi A, Bernardi M. Hepatocellular carcinoma in non-cirrhotic liver: a reappraisal. Dig Liver Dis 2010 May;42(5):341-347. 4. Thomas DB, Hall AB, Michel M. Non-cirrhotic hepatocellular carcinoma in a young active duty male. Mil Med 2011 Apr;176(4):475-476. 5. Yeom JO, Yoon SB, Kim JG, Oh JH, Jeon EJ, Jeong et al. a case of hepatocellular carcinoma combined with Liver abscess. korean. J Gastroenterol 2009;53:378-382. 6. Hayashi T, Honda H, Kaneko K, Fukuya T, Tateshi Y, Ro T, et al. Hepatocellular carcinoma with pyrexia: report of a case. Radiat Med 1995 May-Jun;13(3):133-136. 7. Terzis I, Haritanti A, Economou I. Fibrolamellar hepatocellular Carcinoma: a case report with distinct radiological features. J gastrointestinal. Cancer 2010;41:2-5. 8. 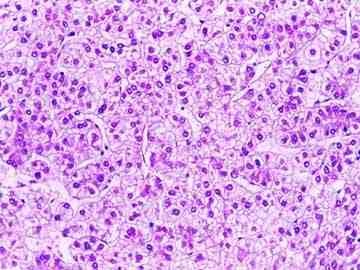 Kumar P, Clark M. Hepatocellular carcinoma. Clinical Medicine, 5th ed. Toronto: W. B Saunder 2002; p: 384. 9. Abe Y, Makiyama H, Fujita Y, Tachibana Y, Kamada G, Uebayashi M. Severe hypercalcemia associated with hepatocellular carcinoma secreting intact parathyroid hormone: a case report. Intern Med 2011;50(4):329-333. 10. Ghobrial MW, George J, Mannam S, Henien SR. Severe hypercalcemia as an initial presenting manifestation of hepatocellular carcinoma. Can J Gastroenterol 2002 Sep;16(9):607-609. 11. Douglas S, Kevin R, Stuart A. Liver disease. Radiology secrets.1st edition. USA: Amazon.com 1998, P132. 12. T, Meloni F, Di Stasi M, Rolle E, Solbiati L, Tinelli C, et al. Sustained complete response and complications rates after radiofrequency ablation of very early hepatocellular carcinoma in cirrhosis: Is resection still the treatment of choice? HEPATOLOGY 2008; 47: 82-89. 13. Llovet JM, Ricci S, Mazzaferro V, Hilgard P, Gane E, Blanc JF, et al; SHARP Investigators Study Group. Sorafenib in advanced hepatocellular carcinoma. N Engl J Med 2008 Jul;359(4):378-390.